I have bought a Glen L design boat. 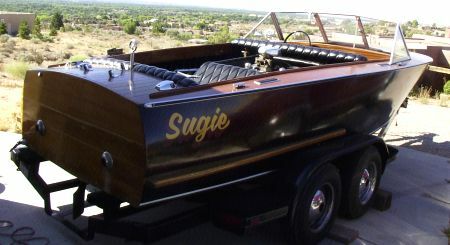 Her name is "Sugie", and was built by Glenn R. Chamberlain, Portland, OR in the late 1960s & 70s. MIST MISS / Glenn A. Watts / Corrales, NM / 08-21-03: I am just starting the restoration. Actually working on replacing a boat trailer axle & replacing all the bearings/races. Next is an oil change for the 401 cu. in. Buick engine. Then I'll reseal some opening in the fiberglass on the transom. Lastly reseal the mahogany deck and re-register the boat in New Mexico which may require repainting the boat registration number.